It's suppertime and supper's nowhere is sight. If this is your life, Suppertime Survival is your book! 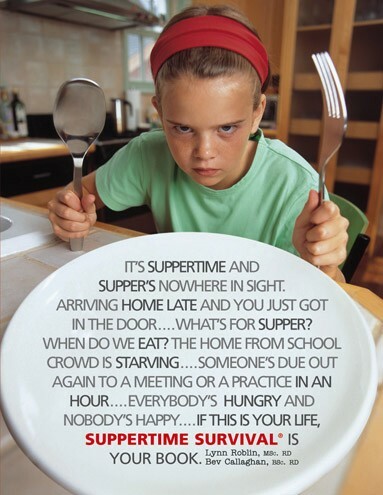 Suppertime Survival - by Lynn Roblin, MSc.RD and Bev Callaghan, BSc. RD is more than a cookbook! It's a "how to" guide for busy parents, teens and college age kids. Suppertime Survival has been revised and updated to tackle the obesity epidemic head on by teaching family members how to plan, cook and eat healthy meals. This book clears the confusion over "what is a healthy diet" and provides simple diet and menu plans based on healthy foods and sensible portion sizes. To help get meals on the table quickly and easily, this book provides tips to help you get organized, lists for basic cooking equipment and pantry ingredients, and shopping lists with every recipe. It's a departure from most other cookbooks as it classifies meals by how much time you have to cook and eat them. Choose from Anytime Meals, Quick Fixes, Make and Bakes and Make Ahead Meals. Suppertime Survival is a complete family eating guide dispensing advice for picky eaters, growing children, teens and in betweens, college age kids, and busy moms and dads. It answers questions such as "What is a healthy weight? ", "What should kids eat if they are active in sports? ", "How do I cook for my vegetarian teen? ", "How do I know what foods are best to eat?" Suppertime Survival is available for bulk discount orders for fundraising for daycares, schools sports teams, community groups and others.